NXP Semiconductors has showcased a proof-of-concept connected car that makes use of long-range UHF RFID tags and NFC to help drivers of the future access and pay for restricted parking spaces, get warnings of traffic jams and allow groceries or parcels to be delivered directly into their car without them even being there to open the trunk. The concept car, designed by Rinspeed, would also let the driver unlock doors and set mirror positions, radio stations, temperatures and seat settings by placing their smartphone in an NFC and wireless charging pad at the front of the vehicle. 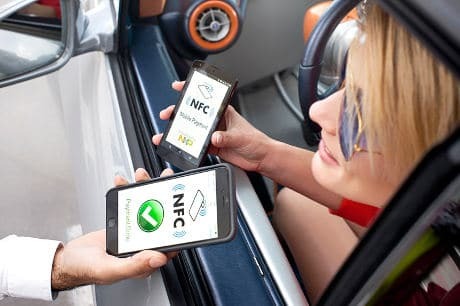 “The connected car is very relevant for car sharing and car rental,” NXP’s senior international product marketing manager Rainer Lutz explained to NFC World during a demonstration of the connected car at Mobile World Congress 2015. “In big cities, congestion is a major challenge, so there is a fast increasing number of offerings for car sharing where you don’t actually own the car but you can get access to the cars that are free floating in the streets. If you want to get access to the car, you look on your smartphone to see where it is, then you get a secure digital key sent to the phone and then you can open up the car. 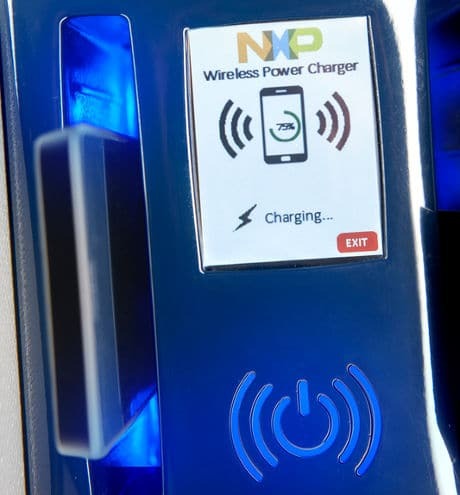 “And if you are listening to music on your smartphone, after entering you just place your phone in the NFC charging bay and it creates an NFC connection to stream your music automatically into the car. “You see it’s also charging because your phone battery is low. Your phone knows you, your telephone numbers, how you like your seat, what temperature you like and it automatically adjusts the car towards your liking. It’s just so fluid; you go inside, you put your phone in the slot, you’re connected and you feel at home. “The concept also features car-to-car communication technology which is something that is up and coming,” Lutz continued. “Cars can warn each other over distances of two kilometres if there’s an ambulance passing by and you get directed to change lanes to let the ambulance pass, even before you actually see the ambulance. If there’s an accident you want to warn others that you’ve stopped. “This has to be done in a secure way because you don’t want to have any hackers interfere with your car. First of all, you need to make the communication part and then you need security. The beauty of NXP is that we have a strong position in ICs for electronic passports and banking cards. We do most of the chips for public transport so that’s why we have the technology to bring to the car. “We leverage the system technology and put it into the car for the car-to-car communication platform. Beyond this, companies like DHL conceived the delivery-to-your-trunk concept. With your purchase, you can allow a one-time access to your trunk. “Basically, the DHL delivery employee receives the location of your car, and with the built-in NFC reader in the trunk, he or she touches his card or his phone against the trunk, puts the delivery in, closes it again and you get a text message saying your parcel has been delivered. “The car you see here is a concept car,” Lutz added. “Rinspeed is a Switzerland-based automotive think tank that designs every year a concept car. They invite industry technology leaders to give their view of what the future car will look like. Those ideas and the technologies that each company contributes are then introduced into the car.